Roller pasta makers require you to work the dough by hand and then run it through the roller multiple times. Some extrusion pasta makers don't even require mixing the ingredients before placing them in the machine. I have a hard time believing that the extrusion models can produce the same quality pasta because the dough is not kneaded or sent through the roller. What is the difference between the noodles produced by each method? I am absolutely of the opinion that the roller type makes better pasta unless you're considering hugely expensive commercial extruders. I think I spent about $30 on it. I make my pasta dough in my food processor, and the pasta is as good as I have ever had. Yes, it requires that you knead; that's half the fun and it produces much, much better pasta. I did not like the pasta. I found it to always have a grainy texture, even if I used 00 flour or followed the recipes that came with the machine. The machine just doesn't knead enough or right or something. That one cost $250 I think. The only reasons to prefer this one to the other is if you want shapes (I prefer noodles and ravioli anyway to macaroni), or if you really, really hate kneading. See: Can anybody help make homemade pasta foolproof? for two different, both excellent, methods. 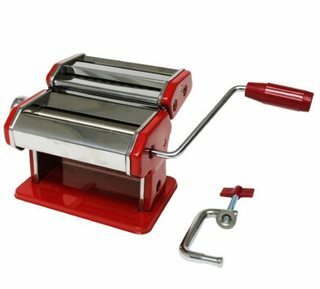 Since you had me looking on amazon anyway, I'll show you the one I would buy if I was in the market and didn't mind the idea of spending a little extra money: Marcato Pasta Machine with Attatchments. This one is the bestseller for good reason: Marcato Pasta Machine. This very inexpensive option has been fine for me, but I sometimes wish I had one of the higher quality Marcato rollers. It's a bit rough around the edges, especially cutting, but it's functional. 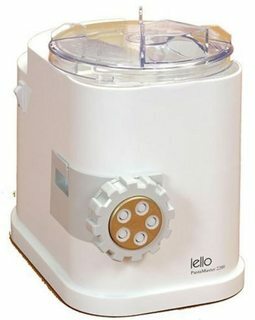 Norpro Pasta Maker. They are different products, so identifying one as better would be a false comparison. In terms of producing a quality product, both excel as long as one is using correct ingredients, good technique, and quality tools. There is probably a lot of information on this forum on both types. Shape is not the only difference. Rolled pasta typically uses a softer flour and egg. Extruded pastas typically use semolina and water. The mouth-feel and ability to interact with other ingredients on the plate are completely different for each product. So, it is not a question about which is better, but rather a question about what kind of dish you are trying to achieve. The roller type works great if you want to dry the pasta - the dough through the roller develops the gluten and holds together when you dry it. A good extruder type (the Simac, Lello are very good in my experience IF you know how) will make great pasta that you put directly into boiling water without drying or waiting. The secret to the Simac machine (extruder) is to make sure all the flour mixes well and mixes long enough (the flour falls through the cracks into the auger - you need to leave the auger out and remove all that flour and put back into the dough before you start extruding the pasta). You also want the dough pretty dry and crumbly but if you get it too dry it will jam or break the die -- so you need to learn just the right consistency and knead it longer than you think. It also helps to warm the auger and die in hot water and rub a little olive oil on them just before you start extruding. With the Simac/Lello machine, if you try to dry the pasta it will have a crumbly/grainy texture so I don't advise it ... but if you go straight from extruding the pasta to putting it in the boiling water (for a very short time - like 2 minutes) I find it to make excellent pasta. I use egg and Semolina. Sometimes I'll mix Semolina and AP flour - but I prefer 100% semolina.